While the Oliva family of cigar crafters is now one of the most recognized names in the world of premium cigars, it wasn't until the mid-2000s that they really began attracting serious attention. This was due to the family's signature release—Oliva Serie V—which was launched in 2006. The cigars were/are rolled in small batches by the Oliva's top torcedores, featuring high-priming tobaccos to showcase the most robust and flavorful experience in the family's entire portfolio. The cigars were quick to gain critical acclaim and, two years later, were followed by a limited edition maduro counterpart—Oliva Serie V Maduro Especial. This maduro variant incorporates a similar core recipe to the traditional Oliva Serie V, being a Nicaraguan-based blend with a focus on strong ligero primings from Nicaragua's Jalapa region. But the Oliva Serie V Maduro Especial replaces the sun-grown wrapper of the original blend, featuring a dark maduro leaf in its place. Oliva Serie V Maduro Especial 2018 is the 11th installment in the annual Especial series. For this release, the Olivas have utilized a dark and oily Mexican San Andrés maduro wrapper over a slightly tweaked filler blend. As with the past few iterations, the cigars have been rolled in a singular Double Toro size (6" x 60), a fan-favorite within the series. Smokers can expect a medium/full body, unloading rich flavors of earth, mocha, bell peppers, zesty cinnamon, and big blasts of baker's cocoa. 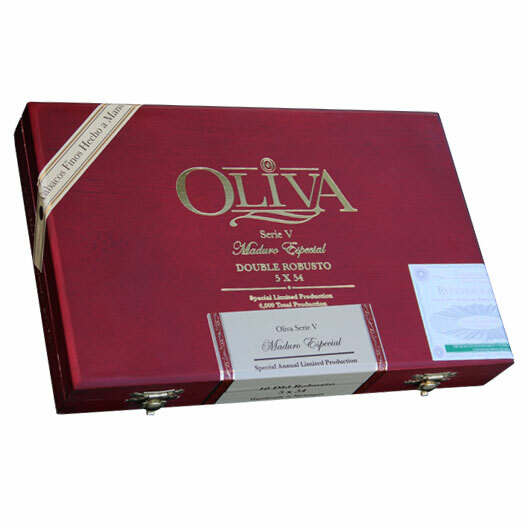 This is an annual, limited edition cigar; Oliva Serie V Maduro Especial 2018 will only be offered while supplies last.